Our Disabled toilet keys fit the Wellington lock that is used by Radar and the National Key Scheme, helping you access the 7000 disabled toilets across the UK. 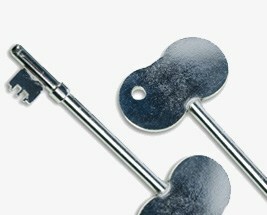 We sell keys with a larger head for those with limited dexterity and a standard shaped key. If you are a council, disability group or retail chain with disabled toilets, you may be interested in our bulk packs of 50 keys with dramatically low prices. We test every key before it is dispatched.